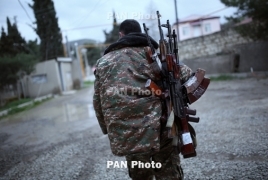 PanARMENIAN.Net - The parties to the Nagorno Karabakh conflict agreed on a bilateral ceasefire along the contact line which came into force at 12:00 midday, April 5, Artsakh Defense Army spokesman Senor Hasratyan said. According to him, negotiations are still underway. On the night of April 1-2, Azerbaijani armed forces initiated overt offensive operations in the southern, southeastern and northeastern directions of the line of contact with Nagorno Karabakh. As many as 20 Karabakh servicemen were killed and 72 were wounded in the course of military operations. In addition, 4 civilians and 5 volunteers have been killed. 26 Karabakh soldiers have gone missing so far. As of 10:00 p.m., April 5, the Azerbaijani side has lost 29 tanks and over 5 armored vehicles, including an IFV, as well as 1 TOS-1A Solntsepyok multiple rocket launcher, 1 BM-21 Grad multiple rocket launcher, 2 military helicopters and 7 unmanned aerial vehicles. Seven Karabakh tanks have been neutralized since April 2. The Armenian side has lost eight positions (300 meters overall).